I’m a bit embarrassed to realize that it’s just about February, making it almost a year since my last post. Even more embarrassing, is to see the amount of dust sitting on my shelves and the few tack models I have staring at me from my desk. *sigh. I set aside a few works-in-progress, that I was having difficulty working on, only to get swept up in other things. I’ve poured every free moment into training my little horse. My real one. And I’ve come to remember that feeling of over joy, as a seven-year-old little girl riding a horse for the first time. The passion, the love for horses, that gets buried under the years of ‘adult’ responsibilities, over thinking, and real life. I also got sucked into a new endeavor. 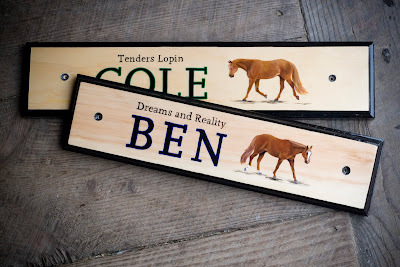 Hand painted stall signs. Don’t worry; I have not stopped making tack. I’m hoping this long absence will help me take on a different perspective, and spark new ideas. Since sometimes we all just need a break. I'm thankful to stumble upon your blog. I'm impress with your painting. It is really awesome. Just keep training you're little horse. 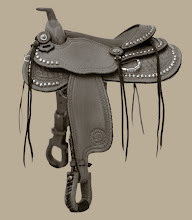 Horses really need a good horsemanship.